The fields of modular and origami robotics have become increasingly popular in recent years, with both approaches presenting particular benefits, as well as limitations, to the end user. Christoph Belke and Jamie Paik from RRL, EPFL and NCCR Robotics have recently proposed an elegant new solution that integrates both types of robotics in order to overcome their individual limitations: Mori, a modular origami robot. Mori is the first example of a robot that combines the concepts behind both origami robots and reconfigurable, modular robots. Origami robotics utilises folding of thin structures to produce single robots that can change their shape, while modular robotics uses large numbers of individual entities to reconfigure the overall shape and address diverse tasks. Origami robots are compact and light-weight but have functional restrictions related to the size and shape of the sheet and how many folds can be created. By contrast, modular robots are more flexible when it comes to shape and configuration, but they are generally bulky and complex. Mori, an origami robot that is modular, merges the benefits of these two approaches and eliminates some of their drawbacks. 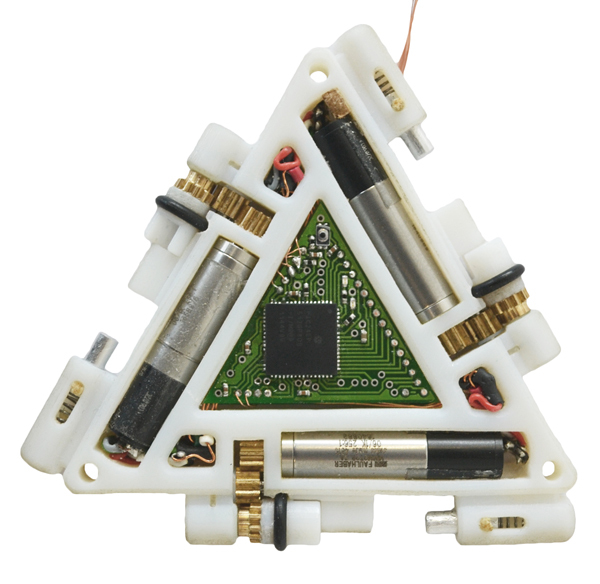 The presented prototype has the quasi-2D profile of an origami robot (meaning that it is very thin) and the flexibility of a modular robot. By developing a small and symmetrical coupling mechanism with a rotating pivot that provides actuation, each module can be attached to another in any formation. 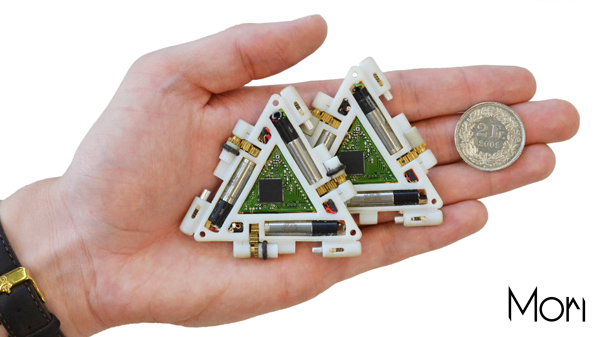 Once connected, the modules can fold up into any desirable shape. The individual modules have a triangular structure with dimensions of just 6 mm in thickness, 70 mm in width and 26 g in weight. Contained within this slender structure are actuators, sensors and an on-board controller. This means that the only external input required for full functionality is a power source. The researchers at EPFL have thereby managed to create a robot that has the thin structure of an origami robot as well as the functional flexibility of a modular system. The prototype presents a highly adaptive modular robot and has been tested in three scenarios that demonstrate the system’s flexibility. Firstly, the robots are assembled into a reconfigurable surface, which changes its shape according to the user’s input. Secondly, a single module is manoeuvred through a small gap, using rubber rings embedded into the rotating pivot as wheels, and assembled on the other side into a container. Thirdly the robot is coupled with feedback from an external camera, allowing the system to manipulate objects with closed-loop control. With Mori, the researchers have created the first robotic system that can represent reconfigurable surfaces of any size in three dimensions by using quasi-2D modules. The system’s design is adaptable to whatever task required, be that modulating its shape to repair damage to a structure in space, moulding to a limb weakened after injury in order to provide selective support or reconfiguring user interfaces, such as changing a table’s surface to represent geographical data. The opportunities are truly endless.